SINGAPORE - We are observing a crash of rhinoceroses, when we hear a grating noise. "Mummy, look," my son says. Kipenzi, a Southern White Rhinoceros, aged five and weighing a robust 1700 kg, is buffing its horn on the bumper of our off-road safari vehicle. Our vehicle rattles slightly on the savannah. The baggy-skinned ungulate attempts to place its foot on the bonnet, in a surprising moment that yields enthusiastic yelps from my three children. "Kipenzi, no," our guide Meaghan states firmly, as she adroitly reverses the vehicle away from the grasslands. Kipenzi, she adds, is particularly sociable, having been hand-raised in the veterinary hospital before being reintroduced to the herd through a delicate process. My family and I are at Werribee Open Range Zoo, a picturesque 225-ha wildlife park just 30 minutes' drive from the Melbourne CBD. Visitors ride safari vehicles to explore the sprawling plains and spot freely-roaming animals such as bison, antelopes, giraffes, camels, oryxes and ostriches. We get up-close with a tower of long-lashed giraffes, feeding them a mixture of sprigs, carrots and sweet potatoes. "I felt its tongue! It's so ticklish," my elder daughter squeals, while my son gapes at two males play fighting, clashing their powerful necks and horn-like ossicones to battle for dominance. Zoos are sometimes a subject of controversy. I cannot help but notice, however, that here the animals at Werribee appear healthy and extraordinarily well-cared for by a team of caring, passionate keepers. "Our goal is to be the world's leading zoo-based conservation organisation," Meaghan says, sharing Werribee's conservation campaigns and research efforts. 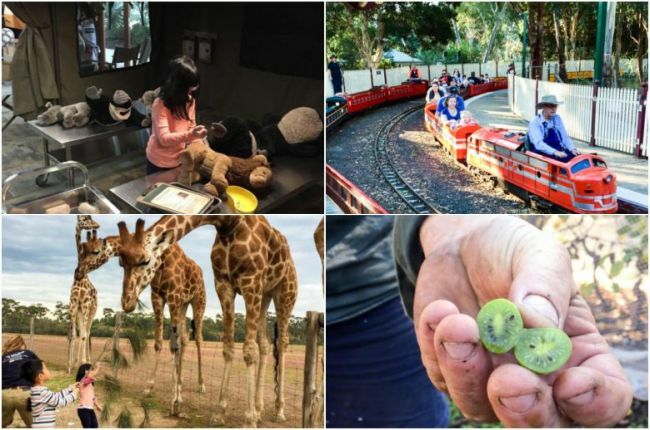 We visit Ranger Kids at the zoo, an indoor play space simulating the Melako village. It is pretend play at its finest. My children don khaki safari vests and binoculars for wildlife patrol, "flying" the wooden helicopter for a birds-eye view to spot injured animals. My eldest daughter plays medic at the field hospital, complete with a surgery area stocked with medical gauze, syringes and scalpels. My son and youngest daughter load large plush lions and zebras via canvas stretchers to the recovery room. "A… dazzle of zebras," my son reads from a leaflet. "And a pride of lions," my daughter chimes, pleased with her expanding stash of collective nouns. My husband nods approvingly. How educational, I think to myself. Learning indeed happens best when kids are having fun, and our trip is turning out to be both enjoyable and informative. And this is just the beginning, as we will discover over the next eight days, exploring family-friendly experiences in and around Melbourne. Miniature railways in community parks, less a tourist attraction and well-loved by locals, is one of our favourite child-centric experiences across Australia. We visit the Diamond Valley Railway ($3 per 15-minute ride, free for children under two), comprising engines and carriages built to one-sixth scale, and run entirely by passionate volunteers on Sundays. "See you later!" My children wave to others at the station, as whistles on two locomotives sound in unison. Our miniature train trundles out of the station, speeding up along the tracks lining the natural Eltham bushland. Children and adults alike cheer and clap when the train emerges from a pitch-black tunnel. We tell a local about our children's fondness for cycling, and he shares that the leisurely and beautiful Bay Trail offers a scenic view of Port Phillip Bay's cool waters. We have time only for a short cycling trail in the city along the Yarra River and around gardens, and can imagine why Melbourne is touted a lovely rideable city. Bike shares for adults have gained traction in Melbourne, but we go the rental option to access children bicycles, and a child seat for my youngest child (Rentabike, rentabike.net.au). On a cloudless day with azure skies, we drive to the balmy seaside suburb of St Kilda, and stroll through the iconic, somewhat kitsch but charming, Luna Park amusement park. My husband and I gawk in amazement at The Great Scenic Railway, helmed fully by a driver standing throughout steep climbs and slides. It is the oldest continually operating roller coaster in the world. Having grown up on staple of books by Enid Blyton, who fired in me an imagination of exciting adventures on farms, I think of crisp fruits picked with tiny fingers straight from bushes. I take my children to Naturipe Farm, located in Bacchus Marsh, where we pick the sweetest and juiciest Albion strawberries, known for their symmetry and vibrant crimson-red. "See, the best way to pick a strawberry - carefully flick it off the stem," my daughter tells her younger sister. We watch our city-born-and-bred children shed their reservations towards large animals at Myuna Farm, a working community farm in Melbourne's south east. The children walk the trails around paddocks in delight, feeding a variety of farm animals, including sheep, goats, llamas, alpacas, pigs and kangaroos. My youngest child is thrilled with her first experience on a pony ride, and aboard a tractor that winds its way past animals down to the wetlands. In Yarra Valley, we ride another tractor at Rayner's Orchard, a family-run boutique fruit farm that grows over 450 varieties of fruit. Our children sample unusual species picked straight from the tree, such as feijoia, strawberry guava, quince and tamarillo. "This is the kiwiberry, which costs $70 a kilogram," Len, the owner, showing us its cross-section which looks just like the green kiwi, but sized like a small berry. It is extraordinarily sweet. At the nearby Yarra Valley Chocolaterie and Ice Creamery, set in a picturesque landscape of undulating hills and manicured lawns, we enjoy a child-pleaser's lunch of sandwiches, pizzas and ice cream. My kids occupy themselves with the free tastings of delicious pastilles, while I bag inviting chocolate bars, truffles and nougat. On an overnight trip to Philip Island, under two hours' drive from Melbourne City, we view at sunset adorable Little Penguins waddling ashore after a day of fishing, to their nests in the sand dunes. We also visit the Churchill Heritage Farm, which feels somewhat touristy, but offers my children the experience of milking a cow. We stroll the treetop boardwalks at the Koala Conservation Centre, where we admire marsupials in their natural habitats. "Can we ride that tram, please?" My son points to a maroon tram with gold trimmings, once we are back in Melbourne City. He plonks himself at the front of the Heritage 'W class' trams, complete with wooden chairs, brass and leather hand straps like the originals from 1923, admiring nostalgic engineering of the old-school dashboard. We alight near the Melbourne Museum (free for children under 16 years), which houses a Children's Gallery with interactive zones and play spaces designed for three- to eight-year olds. Children enter via a child-sized tunnel, with railway-style tiling and soundscape. My youngest daughter disappears into large net climbing structure, while her siblings duck under the amargasaurus and quetzalcoatlus skeletons flying above them. Budding palaeontologists can also excavate a mamenchisaurus skeleton. 'Wild', my favourite exhibit, features over 600 stuffed birds, reptiles, mammals and amphibians displayed by biographic regions, and accompanied by interactive screens. We explore Melbourne's famous street art, walking through organic art clusters at the cobblestoned Hosier Lane and rock-themed AC/DC Lane. My husband gets some respite at the City Library, where my kids are entertained by a generous offering of junior fiction. I happily head off to the nearby Degraves Street, where I discover charming shops such as Il Papiro (selling artisan stationery), Sine Qua Non (displaying quirky handmade jewellery) and Clementines (stocking an intriguing range of Australian products). I am particularly intrigued by Rooftop Honey, local raw honey harvested via hives on the roof spaces of cafes, restaurants, hotels in the heart of the CBD and suburbs. My children are inheritors of my husband's and my hearty appetites, and no trip is complete without gastronomic exploration. Our first stop is Hardware Societe (120 Hardware Street), possibly the most instagrammed café in Melbourne, where we enjoy sharing portions of fried brioche with Nutella, berries and poached fruit; duck confit and baked eggs with garlicky chorizo sausage. At Osteria Ilaria (367, Little Bourke Street) we enjoy the octopus chargrilled with 'njuda, corn-fed Gippsland duck and pork chop special. It has become somewhat a family tradition on our Australian visits to 'yumcha' (or 'to drink tea', typically used interchangeably among Asians in Australia with eating 'dim sum'). We enjoy baskets of steaming delights against a backdrop of clattering trolleys and Cantonese conversation. At 8bit Burger (231 Swanston Street), we feast on wildly addictive burgers and see why 8bit is a strong contender for Melbourne's best burger. Our favourite is the Altered Beast, with beef, bacon, cheese, grilled onions, lettuce and 8bit sauce. On one of our final evenings, we enjoy spectacular views of Melbourne at the Eureka Skydeck, where we board the fastest elevator in the Southern Hemisphere that propels us to the 88 th floor. My kids cling on for dear life when we step onto 'The Edge', a clear-glass cube that extends as an overhang, a dizzying 285 m above ground, complete with thriller sound effects. "That was way too exciting," I tell my husband. "Yes," my pale-faced daughter chimes. And as with many adventures on this trip, she adds, "When can we do it again?"